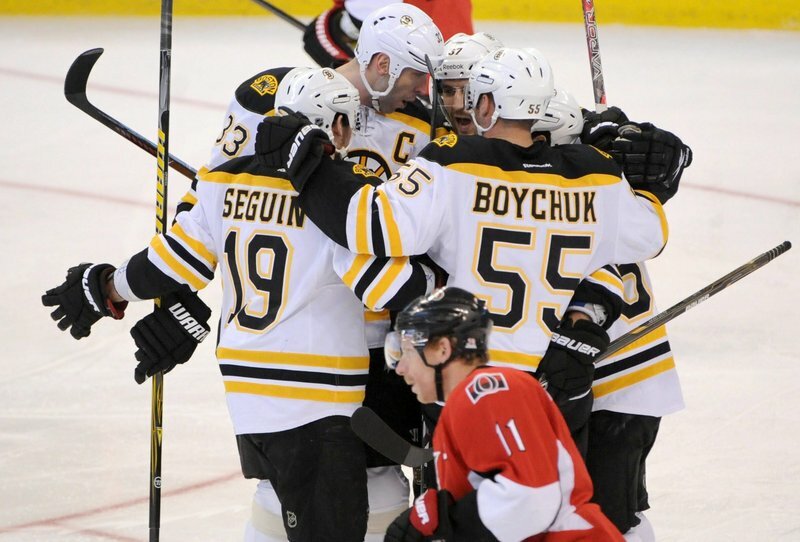 OTTAWA – Patrice Bergeron had two goals and an assist to lead the Boston Bruins past the Ottawa Senators 5-3 on Saturday night. Daniel Alfredsson led the way for Ottawa with two goals, while Erik Karlsson had the other. Karlsson opened the scoring at 1:10 of the first with his 14th goal of the season. But Boston countered with Bergeron’s first of the game at 3:36 before Marchand put the Bruins up 2-1 with 3:47 to go with his 22nd goal. Ottawa made it interesting on Alfredsson’s two goals in less than two minutes. He scored with 3:45 remaining before registering his 22nd of the season with 2:08 to go. Jason Spezza picked up his 600th career point on Alfredsson’s first goal. COYOTES 3, OILERS 1: Mike Smith stopped 21 shots for his 10th straight victory as Phoenix won at Edmonton, Alberta. Oliver Ekman-Larsson, Ray Whitney and Shane Doan scored for the Coyotes, who won their fifth straight. Ryan Nugent-Hopkins scored for the Oilers. CAPITALS 4, MAPLE LEAFS 2: Alexander Semin and Jeff Halpern scored, and Alex Ovechkin picked up a pair of assists to lead Washington at Toronto. BLUES 3, JETS 2: David Perron scored the winning goal in the shootout to give St. Louis a win at Winnipeg, Manitoba. Perron moved in on Chris Mason in the fourth round and roofed a backhander, ruining the Jets’ rally from a two-goal deficit. Mason made 14 stops for the Jets. RANGERS 3, SABRES 2: Ryan Callahan scored his 100th NHL goal 2:59 into overtime, and New York won at Madison Square Garden. Callahan took a pass from defenseman Ryan McDonagh and broke in alone. He flipped a shot over goalie Ryan Miller’s shoulder for his career-best 24th goal of the season. PENGUINS 8, LIGHTNING 1: Evgeni Malkin had his ninth career hat trick, Jordan Staal added two goals and host Pittsburgh won for the fifth time in seven games. Chris Kunitz, Matt Cooke and Pascal Dupuis also scored, and Marc-Andre Fleury made 34 saves for Pittsburgh, which has won 8 of 9 home games and leapfrogged the Devils in the crowded middle of the Eastern Conference playoff-race pack. PREDATORS 6, SHARKS 2: Shea Weber scored two goals to lead Nashville over visiting San Jose. KINGS 4, BLACKHAWKS 0: Dustin Brown scored three goals and matched his career high with four points, and Jonathan Quick earned his NHL-leading seventh shutout as Los Angeles won at Chicago. AVALANCHE 4, RED WINGS 3: After winning 23 straight at Joe Louis Arena, Detroit has now lost two in a row on home ice, falling to Colorado. The Red Wings hadn’t been beaten in regulation in Detroit since Nov. 3. Their winning streak was snapped Thursday night with a shootout loss to Vancouver. Gabriel Landeskog had two goals, and Steve Downie added a goal and two assists for the Avalanche, who handed the Red Wings their third consecutive loss overall. PANTHERS 3, HURRICANES 2: Stephen Weiss scored the winning goal in the third round of the shootout, lifting Florida to a win at Raleigh, N.C.
Columbus assigned defenseman David Savard to its AHL affiliate in Springfield, Mass. The 21-year-old has two goals and seven assists with 16 penalty minutes in 26 games with the Blue Jackets this season. . The Rangers traded exiled forward Wojtek Wolski to the Florida Panthers for minor league defenseman Michael Vernace and a third-round pick in the 2013 draft.